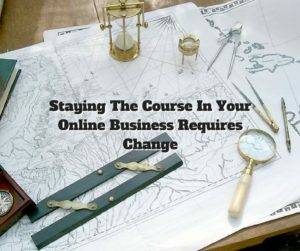 If you are going to stay the course in your Online Business, you will need to change every day like a Pilot is always making course changes. As a pilot in my younger years getting from point A to point B was a process of constant checking, updating and checking again. If you didn’t take the time to check where you were and compare to your intended course who knows where you might end up. It would be great if we could set out our path in our Online Business and everything would go perfect, and it wouldn’t require any changes. I can tell you that thinking that way is unrealistic and will end up causing you to fail rather than succeed! I’m going to keep this short and sweet, but hopefully, it will impact you and change how you stayed on course and focused on your business. Many years ago when I started working on my Pilot’s license, I had to learn how to navigate and stay on course. I figured that I would pull out a map and draw a straight line from point A to point B and away I would go. That was just the beginning and only the guideline on paper. There was something called the wind that was affecting our plane going in a straight line. We were always making small changes along the way so that we would end of at point B as we had planned. The next thing that I learned in ground school was how to look at weather and plan for the wind before taking off. Guess what, still was required to make changes along the route to stay on course. How does this relate to your Online Business? We all have goals, or should have, where we want to go with our business. It would be incredible if we could just lay out our plan to get from where we currently are to where we want to go and just go. Well, I’m here to tell you it just doesn’t work that way. You are going to encounter many distractions, delays, road blocks and many other obstacles along your journey. Prepare yourself for these circumstances, or you are going to become very disappointed and may even QUIT! Just understand that there will always be outside forces that you are not going to have control of that will try and knock you off course. If you know this up front and plan for it, you will be able to handle them and make the appropriate changes to get back on course and stay focused. I have found that having the proper training and mentorship has helped immensely. Courses like Ray Higdon’s 3 Minute Expert, Jessica Higdon’s 10K Social Media Recruiting, and Mark Harbert’s No-Fear Video Marketing. Here some other posts that you may find useful. What’s Your DMO and How Consistent Are You?